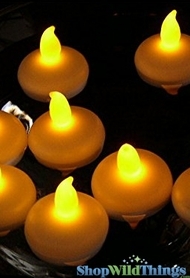 These floating LED tea lights are water activated and easy to use! 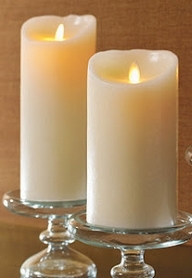 LED candles are awesome for parties and weddings because there is no open flame to worry about. 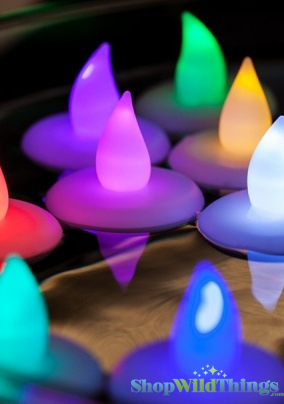 Your guests will be delighted and the light and color dancing off of the water. The wick fades from red to green to blue. Instructions: place them on top of liquid of your desire and voila! 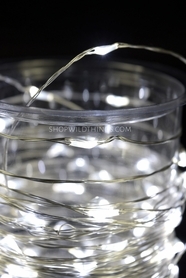 Place in floral bowls in your centerpieces, in a pool or pond, in the spa....and they magically light up! These guys come in a set of 12 pieces, each 1.5" tall by 1.5" in diameter, and the batteries are non-replaceable. BUT out of each light you get at least 60 entire hours of use! The body and "wick" are both white.